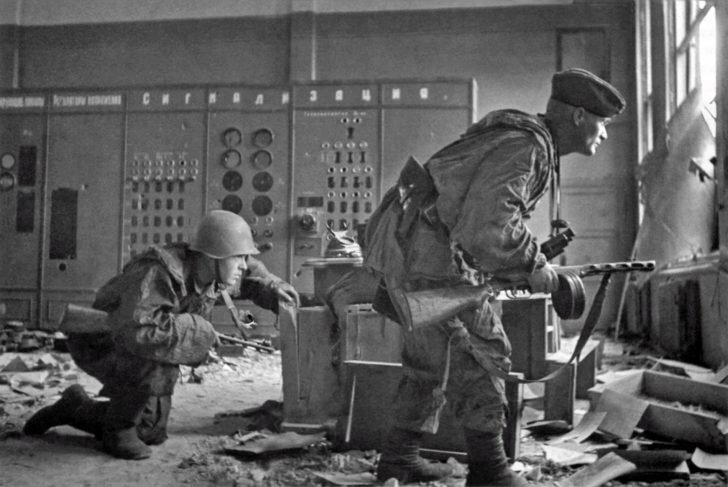 Front scouts from the Soviet 1031th artillery regiment of the 100th Infantry Division of the 40th Army of the Voronezh Front in the premises of the main control room of the Voronezh Hydroelectric Power Station (VOGRES). Left – scout Hanifi Mustakeevich Zhamaleidinov (killed March 24, 1943), right – the chief of intelligence of the 1st Division Lieutenant I.R. Blokhin.